We only accept orders for delivery to Ireland. Please click on delivery icon on bottom of home page for delivery delivery charges and estimated delivery times. Please note all payments are in EURO. We do not accept orders from anywhere else but the beautiful island of Ireland and you will be unable to process an order through the checkout. Hugohome.ie accepts the following credit and debit cards: Laser, visa & mastercard . We also accept payments via Paypal. Don't worry; shopping at hugohome.ie is completely safe, In fact hugohome.ie guarantees the safety of your personal and payment card details. hugohome.ie uses industry standard encryption. methods to deter would-be hackers. 'Encryption' turns your information into a special code that only our computers can unscramble. 7. How are goods delivered and how much does it cost? Information regarding delivery timings and costs can be found by clicking on delivery icon on bottom of home page. 8. Do you have a shop premises ? Yes ! 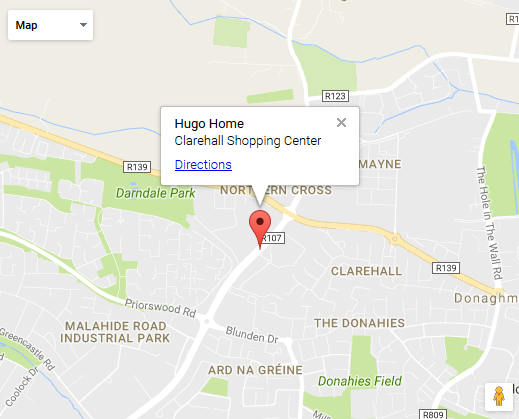 We are based in Clarehall Shopping Centre, Malahide Road, Dublin 17 , Please Visit our store !